One in every 235 homeowners files a theft claim each year. These damages average nearly $4,000 per paid claim, according to the Insurance Information Institute. A major contributing factor to these staggering theft claim statistics is HVAC theft. 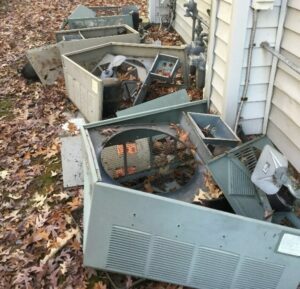 Why is HVAC theft such a common occurrence? HVAC systems include valuable metals that criminals can easily sell. The placement of the units in accessible areas makes HVAC systems vulnerable to theft. The condensing unit is located outdoors and is often placed out of plain sight, especially on commercial buildings, making it very easy for thieves to access without drawing attention to themselves. The desired components can be stolen quickly and easily, if the property owner has not taken preventative steps. 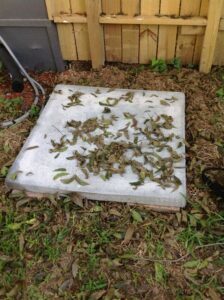 The outdoor portion of the HVAC system contains valuable copper, which is a hot ticket item for thieves. Stolen copper can be sold to scrap yards for up to 90% of its current value. Copper theft has more than tripled in the past five years, and the amount of copper stolen annually exceeds $1 billion (20 Extraordinary Copper Theft Statistics). While the price of copper has declined slightly since its peak in 2011, the value has steadily increased over the past year to $2.91 per pound at the time of this writing (Investment Mine). Additionally, the rising number of copper thefts over the past 5 years led some states to enact stricter regulations on scrap yards, requiring locations to enforce more stringent requirements when accepting salvaged copper. This has resulted in some thieves removing full units, as opposed to simply stealing copper coils and linesets (Copper Theft: The Next Gold Rush). What considerations are required for a repair or replacement option following theft? The main consideration following theft of HVAC components for determining scope of repairs is what components were stolen. However, the theft of a few components can create a domino effect, leading to a major repair or a full system replacement. A few additional factors need to be taken into consideration before determining the scope of repairs required to return the insured to pre-loss condition. 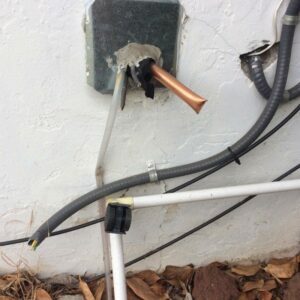 When a thief is stealing copper or the outdoor condensing unit, they will have to cut the lineset that connects the outdoor compressor to the indoor evaporator coil. 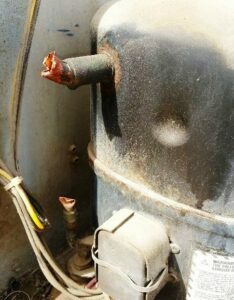 If the lineset is left open, moisture and contaminants can enter the refrigerant loop and lead to a major repair or replacement requirement. The length of time the lineset can remain open depends mainly on the type of refrigerant used in the system. HCFC refrigerants, such as R-22, can typically remain open for a longer period than HCF refrigerants, like R410a. This is because HFC systems use polyolester (POE) oil in the compressor that is more impacted by moisture in the atmosphere than the mineral oil traditionally used in HCFC refrigerant compressors. Some newer R-22 compressors also use POE oils, so the age of the system needs to be taken into consideration, in addition to the type of refrigerant. Some theft damages may require a more extensive repair or even a full system replacement due to the availability of repair parts. This is especially prevalent in older systems. For example, if the coils are stolen and there are no longer compatible coils available from the manufacturer, the outdoor condensing unit may need to be replaced to return the insured to pre-loss condition. This could increase the recommended settlement amount by thousands of dollars. Currently, there are federal regulations surrounding HVAC systems that are enforced by the Department of Energy (DOE) and the Environmental Protection Agency (EPA). The DOE regulates the minimum efficiency standard of newly installed equipment. The efficiency of an HVAC unit is rated by the seasonal efficiency ratio (SEER). 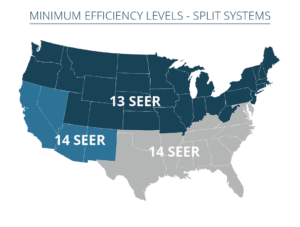 If a split system is damaged by theft and as a result, the outdoor condensing unit needs to be replaced, the new unit must meet the minimum efficiency requirements (currently 14 SEER in the south and southeast, 13 SEER in the north). The SEER rating of the remaining indoor equipment must be taken into consideration because of the potential for SEER mismatch between new and old equipment. 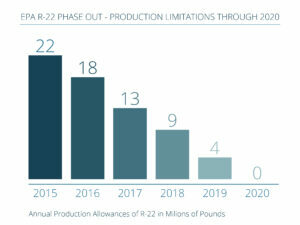 Current EPA regulations are phasing out the production of net-new R-22 refrigerant through 2020. Though R-22 is still being produced and parts are still being manufactured, it is becoming increasingly difficult to find dry shipped condensing units that meet the current DOE SEER requirements. Moreover, R-22 systems cannot be retrofitted to use R410a refrigerant. 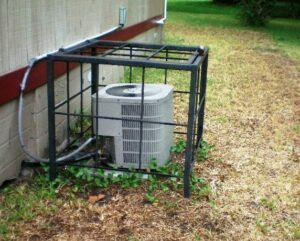 This means that if the outdoor condensing unit is stolen or needs to be replaced, the indoor coil may also require replacement. How can we reduce the risk of HVAC theft? Improve or add lighting surrounding the unit to increase visibility. Because the HVAC unit is often tucked away out of sight on the property, outdoor lighting may not illuminate it, making it easy for a potential thief to access. An even better option is to install motion-censored lights, which will activate when someone walks in the path of the motion detector. Install metal cages around the HVAC equipment. Manufacturers produce HVAC system specific security cages, which allow the unit to be locked away from theft, while maintaining the airflow required for the system to operate properly. Incorporate an HVAC alarm system. These alarm systems typically connect to a standard security system. If power is manually shut off to the HVAC system, or the refrigerant pressure levels suddenly drop, it triggers the security system. Add a video surveillance system and signs that notify potential culprits that the site is being recorded, which will deter many thieves. If a theft does occur, video footage of the crime can be accessed, which can potentially assist in finding the culprit. What does this mean for insurance carriers? As long as HVAC theft remains a prevalent concern, it is critical that insurance carriers take all steps necessary to reduce indemnity leakage. This can be achieved by ensuring that claims are settled for a proper repair scope, as opposed to simply replacing every system subjected to a theft. Additionally, agents and risk managers can help policyholders to properly reduce the risk of HVAC theft and reduce the exposure of insurance carriers for theft claims.